Here’s a description from the back of the book. * Women over 50 who ignored aches and pains to rediscover the joys of a childhood passion. Young adults who read this book will come away with an understanding of the roads their great-grandmothers, grandmothers, and their own mothers traveled to bring the game into the future. Those who grew up before Title IX may find themselves or loved ones in the stories of women who kept the earliest flame alive and grew the game for their daughters to enjoy. Jackie MacMullan – ESPN Senior Writer and author of When the Game was Ours, with Magic Johnson and Larry Bird. JOANNE LANNIN played basketball in high school and college and currently plays on a senior women’s team. She was a sports and feature writer for the Maine Sunday Telegram in Portland, Maine for 22 years. She writes a blog about women’s basketball at http://www.findingawaytoplay.com. Hello Joanne…. wow…how news spreads! 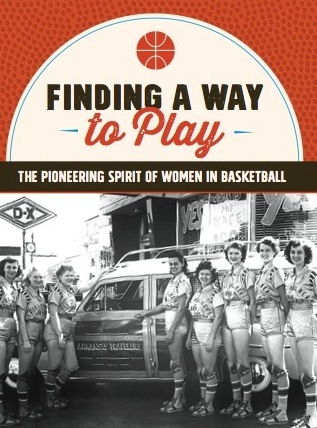 I live in Dallas… and another basketball lady friend of mine near San Antonio/Austin contacted me to say someone had sent her your book…and also mentioned that you had mentioned my name and specific connection to senior women’s basketball in Texas! How nice of you to include me in your book. I’ve promoted fitness and staying involved in life and living through senior women’s sports for about 13 years …. (I’m now 76) I too just published my first book – self published through CreateSpace/Amazon…. (what a project that was!!) “the Last Train Out” by Rudy and Kay Seamayer…. on Amazon. We have a lot of pickleball enthusiasts here in maine. I will check out your book on Amazon too!